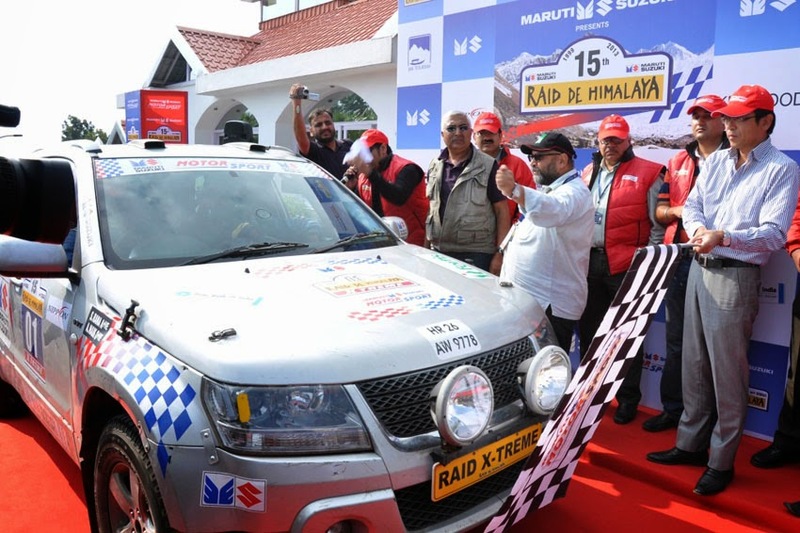 Maruti Suzuki's most endearing and challenging motorsport rally, the 15th Maruti Suzuki Raid-de-Himalaya was ceremonially flagged-off from Shimla by T. Hashimoto, Executive Director (Marketing & Sales), Maruti Suzuki India Limited. Himalaya is marked by the highest number of entries ever, and a number of firsts to its credit. This year, as many as 153 teams are competing in this arguably one of the toughest rallies in the world and test competitor's dexterity in handling rough roads, uncertain and extreme weather conditions. Add to the adventure and excitement an all new scooters category and a large female contingent. "Maruti Suzuki Raid-de-Himalaya is not only a pioneer motorsport event in the country, it has put India on global motorsport arena as it combines the challenges for the participants at par with the toughest motor rallies in the world. Today, the ever increasing participation across age groups and gender is a testimony to this stature of the event. It is heartening to note that this year we have an increased participation from women, from the services, and bikers. As a market leader, we feel proud that Maruti Suzuki created platform for motoring enthusiasts not only from the country but from across boundaries," said T. Hashimoto. After the ceremonial flag-off, the rallyists will set-off for the first competitive leg to Manali. This year the rally will run again in two different routes for the X-treme and Adventure Trial categories. Enroute, participants and their machines will brave challenges thrown by some of the highest mountain passes in the world. The rally will culminate in Leh on October 12, 2013 with prize distribution to the winners of 15th Maruti Suzuki Raid-de-Himalaya. The X-treme rally shall be flagged-off from Shimla and head towards Manali via Dalog, Chamola, Luhri, Behna, Chimni, Khanag. The second leg will start from Manali and head towards Kaza via Gramphoo and Losar. The third leg is a Kaza to Kaza Monastery Necklace loop; the rally will start from Kaza and head towards Demul Jn, Lingti and reach Shichling, from Shichling, the rally will head back to Kaza. The fourth leg will see the motorists head to Pang after crossing Gramphoo, Patseo and Sarchu. Next day fifth leg starts from Pang and head towards Leh crossing Debring and Daat. The final leg is a Leh to Leh loop. The drivers shall start from Leh and head towards Wari La, Khalsar from where the drivers will head back to Leh after crossing Khardung La pass, the highest motorable pass in the world. The Adventure Trial rally will be flagged-off from Shimla and head to Manali via Sunni, Bakrote, Kelodhar, Garhagushaini, Banjar, Kullu culminating in Manali. The second leg will start from Manali and head towards Tabo via Rohtang Pass, Gramphoo, Kunzum La, Losar ending at Kaza. The third leg is a Tabo to Tabo loop; the rally will start from Tabo and head towards Sichling, Dankhar, Sagnam, Kaza, Demul, Lidang, Poh and culminate at Tabo. The fourth leg starts next day from Tabo and head to Keylong after passing through Kaza, Kunzum La, Batal, Gramphoo and Tandi. The fifth leg will start from Keylong and head to Leh crossing Baralacha La, Sarchu, Pang, Taglang La, Upshi culiminating at Leh. The final leg too is a Leh to Leh loop. The drivers shall start from Leh and head towards Wari La, Khalsar from where the drivers will head back to Leh after crossing Khardung La pass, the highest motorable pass in the world. Maruti Suzuki Raid-de-Himalaya is organised in association with Himalayan Motorsport. "Maruti Suzuki Raid-de-Himalaya 2013 promises to be both hugely difficult and dogged by uncertain whether. As early onset of winters is predicted in the western Himalayan region, participants may actually face snow and icy winds, mercury falling to 15-degree Celsius below zero at places," said Vijay Parmar, President of Himalayan Motorsport.